Min May just arrived. She is a little timid at first and has been pretty overwhelmed with everything so far. She rolls over and shows you her belly for a belly rub and will wave her feet at you to get attention already so we don't think she will be stay shy for long. Her track trainer said she was not shy there and would follow them around. They described her as a quiet, well behaved girl that was very sweet and calm. Min May never actually officially raced because she just didn't do well in schooling so was retired before she really got started. She is very young and won't celebrate her 2nd birthday until April 8th. 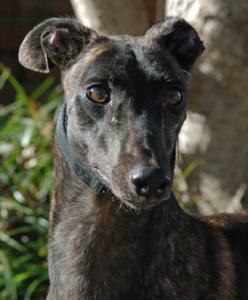 She is a gorgous dark brindle with beautiful shiny coat. She is very tiny probably only about 50lbs. Her sire is the famous Lonesome Cry and her dam is JT Apple Sweet. Min May did great at her first meet and greet cautiously approaching some people and even some children then she layed down and went to sleep. This girl takes her retirement seriously.